German musician Hendrik Weber, aka Pantha du Prince, explores the world of ‘layered and cinematographic’ techno, as described with own words. As he brings childhood memories into craft, and experiences the humanistic nature of anthropology, biology, and Sufi mysticism, the music builds strong intentions and they speak through what technology can create in the manners of delivery. 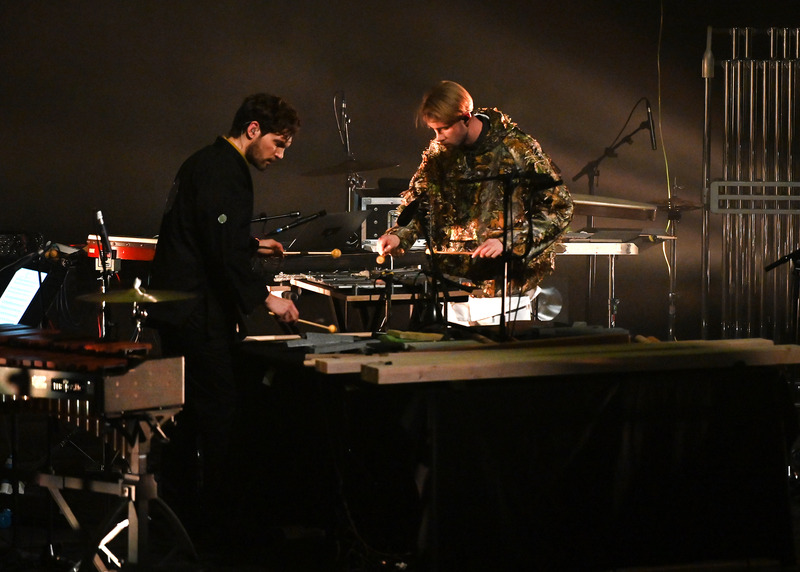 On Saturday 19th January, the audience at the Barbican Hall attended a dynamic show of intrinsic conceptual techno. 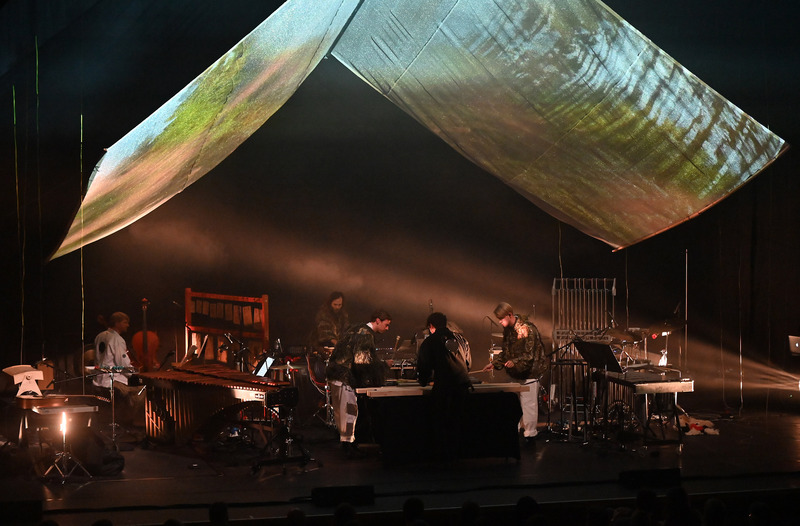 By the virtue of the five musicians, their passionate interaction with a wide variety of percussive and string instruments, live and electronic sounds resonated with the visual projections: each of these aspects forges the DNA of Pantha Du Prince’s new project Conference of Trees. Kicking off the Barbican’s year-long season Life Rewired – a cross-arts events series exploring what it means to be human when technology changes everything – this performance weaved links between the 2012 album Elements of Light in collaboration with the extraordinary Norwegian percussion ensemble The Bell Laboratory, and 2016 album The Triad, with studio musicians and vocals that for the first time in Weber’s technopath included a ‘human touch – something soulful’. It’s all part of a bigger crescendo, isn’t it? Weber’s own-shot footage of deep German forests, long expeditions in French natural landscapes, Swiss Mountains, and the US represents the green scenarios projected on the triangular tent at the Barbican Hall. The five performers danced around the stage, leaving the audience meditating upon the ‘digital dust’, the concept behind the music and its transporter. Right on, multi-instrumentalist Leifur James opened the evening by addressing the theme, with swishing forests and bird sounds smoothly mixed with infused synths, and later unbound hands-on-piano backed up by the electronic power of wooden roots; a good 30-minute live intro. 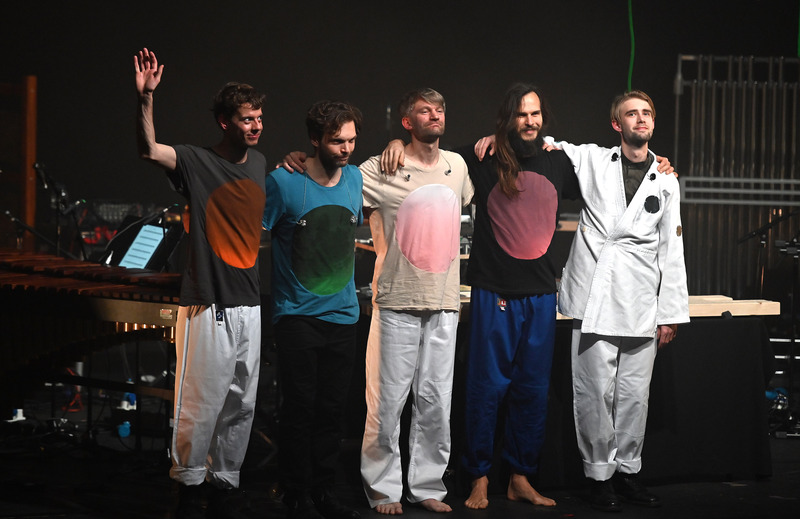 From The Bell Laboratory ensemble (Bendik Kjelsdberg and Hakon Stene, along with drummer Manuel Chittka from the German band Messer, and jazz cellist Friedrich Paravacini), the expedition was a strong invitation to enter into the realm of avant-techno. With cinematographic authority, the music built up through Russian bell crescendos, expansive cello waves and ondes martenot, which effects leverage upon projections of open landscapes scenarios. The communication of trees was given voice and space as the performance acquired ongoing layers of sounds, the more the heavier. The phantoms took customs off as body and mind dove into log drums, frame drums, hand drums, cymbals, stones, marimba, vibraphones, kantele, plate bells and tun kul – a horizontal slit-drum of Maya origins: droning melodies on top of soft vocalisations in simultaneity with enticing sounds of tapping, striking and plucking thrust. Weber’s electronic moves followed the biologic patterns of trees communication – mapping out the space by remaining fluid in one spot and interacting with others through sonic waves. Trees covered wide distances through mycorrhizal networks, without technological wiring, per se. Such was the intensity of this project’s anthropological stance, that people can conceive how the experience of conscious music exploration can be strikingly significant when the questions point directly at how the music delivers itself. The resonance of deep forests descended with traditional techno in the second half of the show. White, green, red and blue lights accompanied the musical mood, entering into lighter and heavier momentums. Pantha Du Prince walked barefoot behind his central station where root branches grew out, and these branches found themselves nearer at times, and at others far apart, focused on the individual musical performance. As described in Sufi mystic Farid ud Din Attar’s The Conference of Birds, Weber imagined the performance to be the opposite of how a forest seemingly appears static, as there’s actually a world of creatures intertwining through time and space – just like the musicians did – plus the 4/4 musical composition was incorporated with ‘patterns of bio-electric energy’. The humanist concepts behind such performances definitely rewire something. There’ll be more of this to experience at Life Rewired, Barbican 2019.